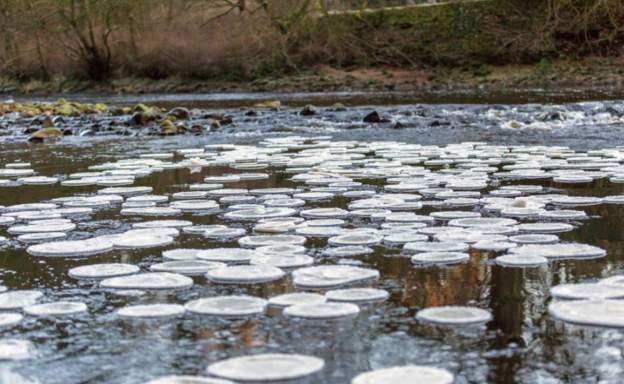 These “pancakes” are believed to form when particles of foam on a river begin to freeze and begin to join together as they are sucked into an eddy and form into a circular shape as a result. They are most frequently seen in the Baltic Sea and around Antarctica, but also form relatively frequently on the Great Lakes of the United States and Canada. We have something in common with Chicago then if not the extreme cold. They were quite a spectacular sight; a ballet of ice as the “pancakes” gyrated around each other in the gentle waters of the eddy. A rare phenomenon indeed; as rare as my passing a pub. The event crowned a superb day of winter walking.